Ok last update for the week! If your group uses wholesale or retail prices (available via the group settings page), you can now view the current markup percentages for all your products on the stock page. 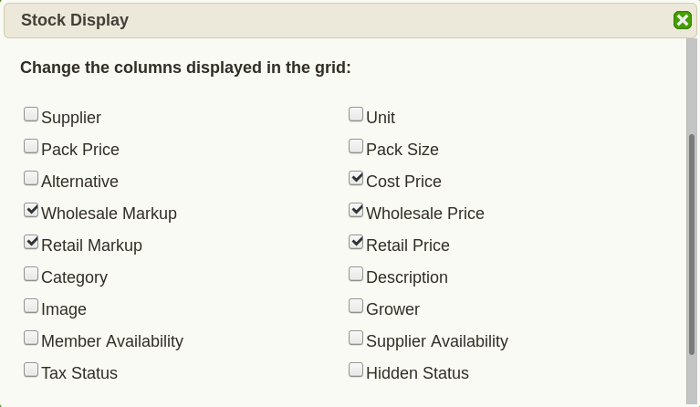 Clicking these checkboxes will add new columns to the grid, just like the other options. The difference with these two options though is that they calculate the current markup from the prices in the grid, they don't store any data. Other than that, they operate just like any other cells in the grid. You can filter and sort by markup, and you can edit the markup to change the price. You can also select multiple rows and update the markup for the selected products, so that each product gets a new price based on it's cost price and the markup you've just provided.